Renovating a small bathroom on a budget? 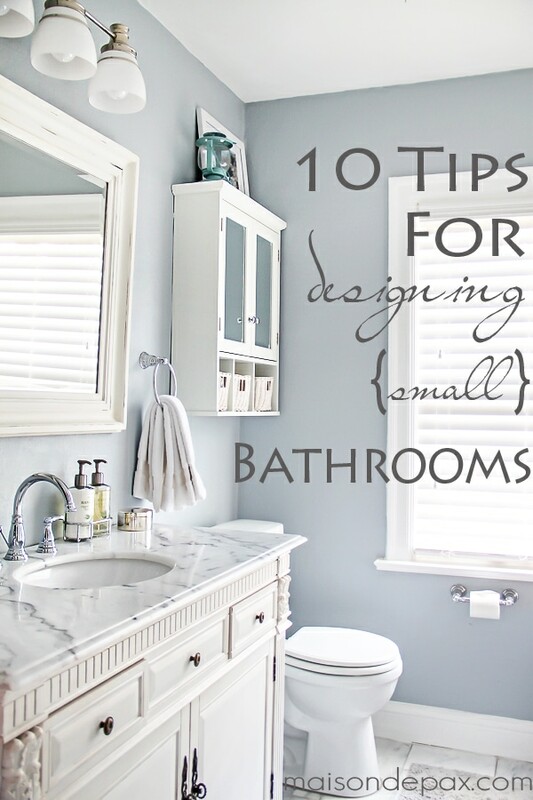 Here are 10 tips for designing a small bathroom. The room is only 6’x7′. That’s pretty small for a master bath, but it doesn’t feel small any more, and I think these are some of the reasons. 2. Even if there’s room for two, consider a single sink to increase counter space. 3. Hang a medicine cabinet above the toilet. I think this is a great alternative to large, built-in cabinetry. A true Johnny cabinet can make the room feel small, and a medicine cabinet above your sink cuts off your personal space (not to mention doesn’t allow you a big, beautiful mirror, which further reflects light and helps your space feel bigger). But a medicine cabinet is the perfect depth to allow decent storage, and above the toilet keeps it out of your way. 4. Like I just said, mirrors reflect light and make a space feel more open… Use them! 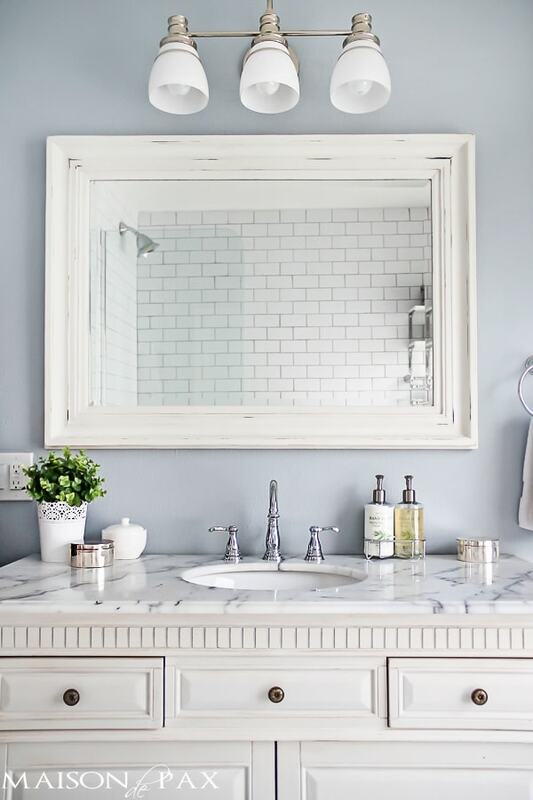 A large one above the sink or a mirrored medicine cabinet is a great way to naturally add to your space. 5. Use open shelving to store towels or other pretty essentials. There needs to be space for towels and toilet paper, and plenty of people have pretty bath salts and such, too. Open storage is perfect for that (we made these shelves simply and affordably using brackets similar to these). 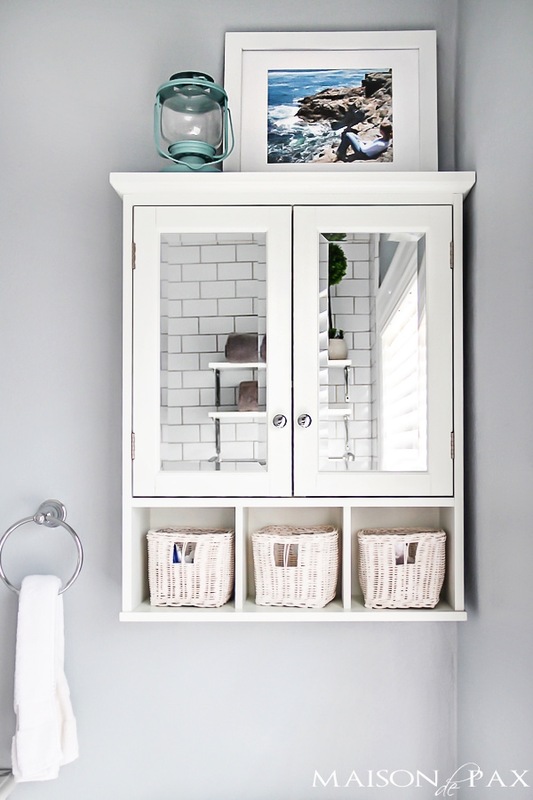 There is almost always a spot for a shelf or two, even if a full cabinet wouldn’t fit… And by moving pretty things to the open shelves, it frees up your cabinet space for all those not-so-pretty bathroom essentials. 6. Create usable space that doesn’t take up visual space with a tub ledge. Obviously, this is dependent on the layout of your bathroom, but I have found our little half-wall tub ledge (below the shelves above) to be wonderful. It was actually my contractor’s idea, and I wasn’t sure at first because I felt the space under the ledge was “lost” or “wasted.” However, I am so glad we decided to do it. Since the ledge is well below eye level, it doesn’t feel like it takes up space, and it offers a place to sit and/or a ledge for books, candles, or whatever. In a tiny bathroom where a chair is not really an option, it’s nice to have a built-in place to put your shoes on or paint your toenails. Plus, it allows for a double towel bar (which, honestly, in a small bath can often feel like they’re sticking out way too far into the room… this way, it only protrudes above the ledge). 7. Gain tub space and luxury with an extra-deep but normal width soaking tub. We chose this soaking tub that is 19″ deep but still only 32″ across. The depth provides a luxurious soak without taking up any more precious space! 8. 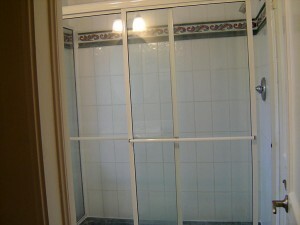 Minimize visual obstructions with a glass shower wall. This was hands down our best decision on the bathroom. Our bathroom has a very strange layout (I’m pretty sure it wasn’t a bathroom in the original house plan) with a huge window located as to preclude any chance of a normal, built-in, enclosed tub/shower combo. Which left us either with the option of a curved shower curtain all the way around the tub (which eats up SO much space) or a glass-enclosed tub/shower. Since the previous bathroom had a nasty plexi-glass enclosed shower, I was pretty sure I didn’t want walls like that partitioning off the small room. So we opted for a simple, stationary, glass half wall. We had a similar one in our apartment in Paris, and though there is some spray out of the tub, it is really minimal. We hung the shower head extra high so that it sprays down instead of outward, allowing a bathmat to catch all that matters. I highly recommend this to anyone struggling with space. 9. Take your shower tile all the way to the ceiling. In a small space, horizontal divisions can break up your space, making it feel smaller and more partitioned. By taking the tile all the way to the ceiling, it adds a feeling of height and draws your attention away from how close the walls are. 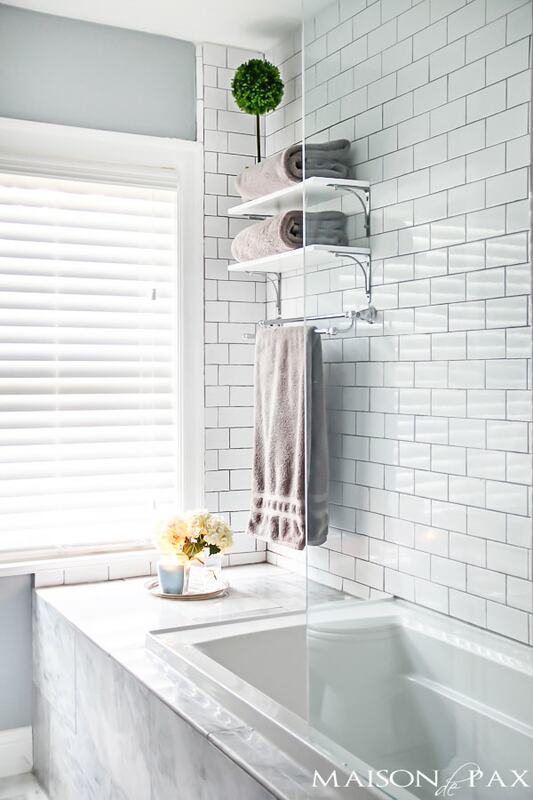 And white subway tile is such an affordable, classic option for this look. You’ll notice that we used only three materials, really: white subway tiles (with gray grout), gray and white marble (we found 12×24 pieces at a local stone yard), and slightly antique white wood. By focusing on quality and simplicity, we were able to make the space feel elegant but not over-crowded. 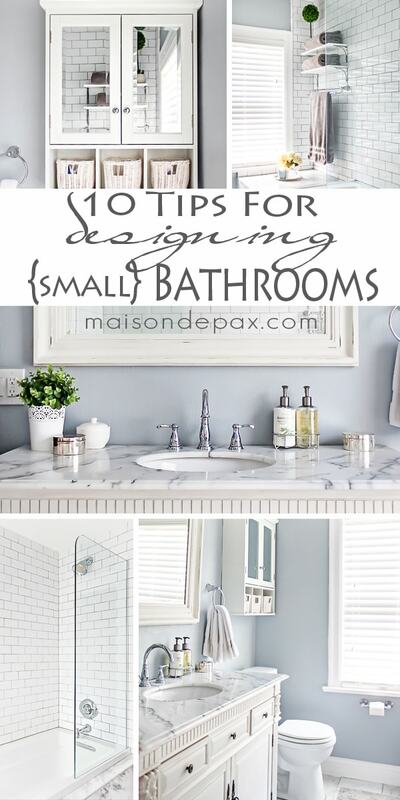 I hope these 10 tips for designing a small bathroom help in some way! I promise to give a source list soon… UPDATE: Source list and budgeting tips from this remodel now available! Please let me know if you have any questions. 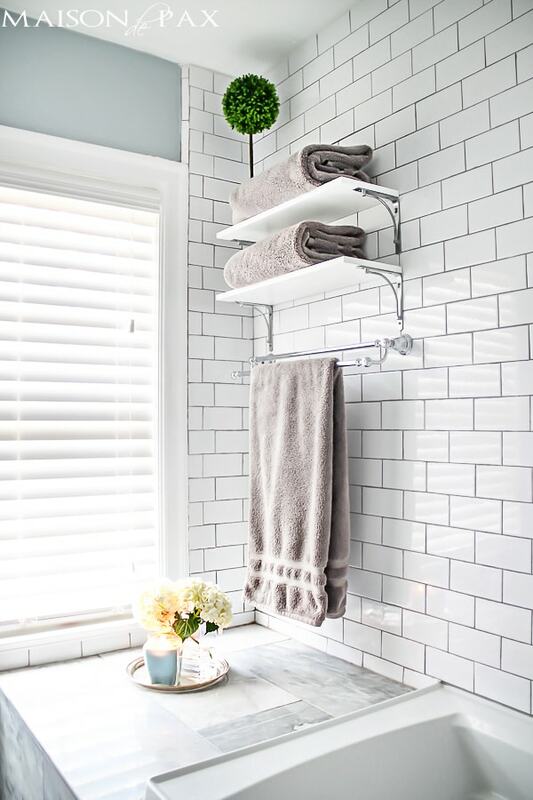 Love your bathroom what color is the gray grout in subway tiles. I don’t want to go too dark with grout. I’m so glad you like it! 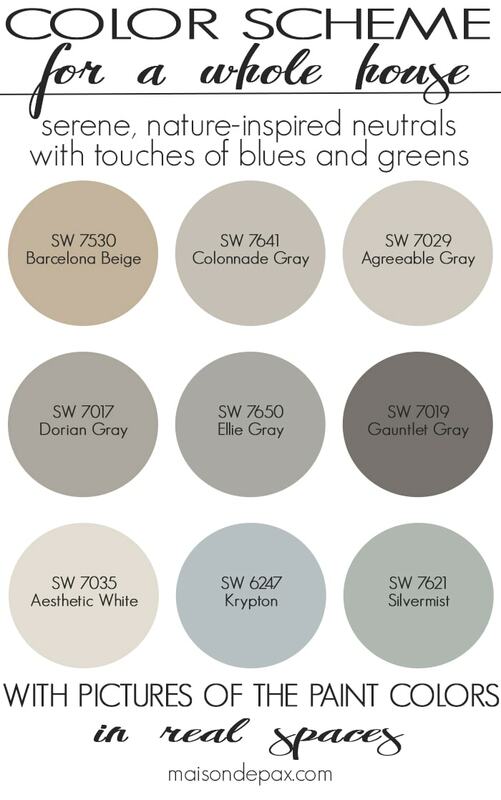 I’m afraid it was several years ago and I don’t remember for certain, but I think we used Delorean gray from Home Depot. So beautiful! I am going to redo my master bath soon and I want to do the same thing with my tub/shower combo. Are there any other pictures that showcase the tub and shower better? Or is that the best due to the space limitations? 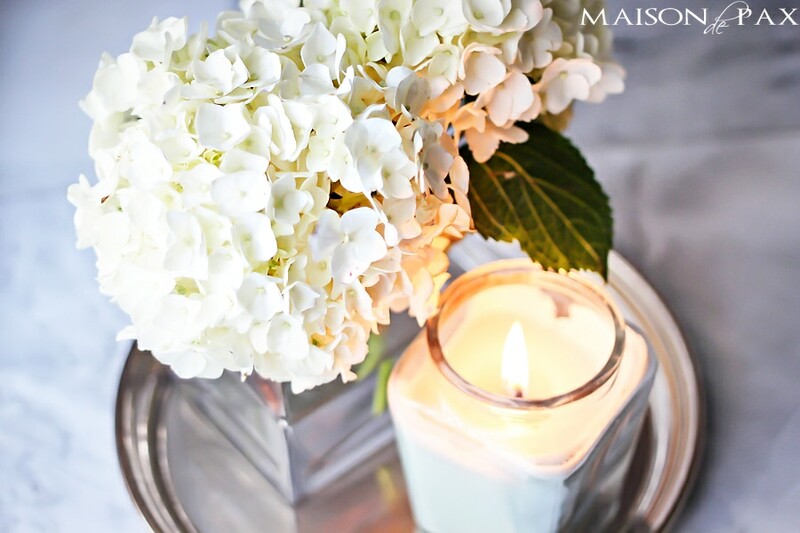 Thanks so much – just found your blog, your home is absolutely gorgeous! These are great tips! I’m moving in a few weeks and love the “less is more” feel of things – it creates such an open and relaxing environment. These tips were very helpful and I love the color you chose! Great tips! 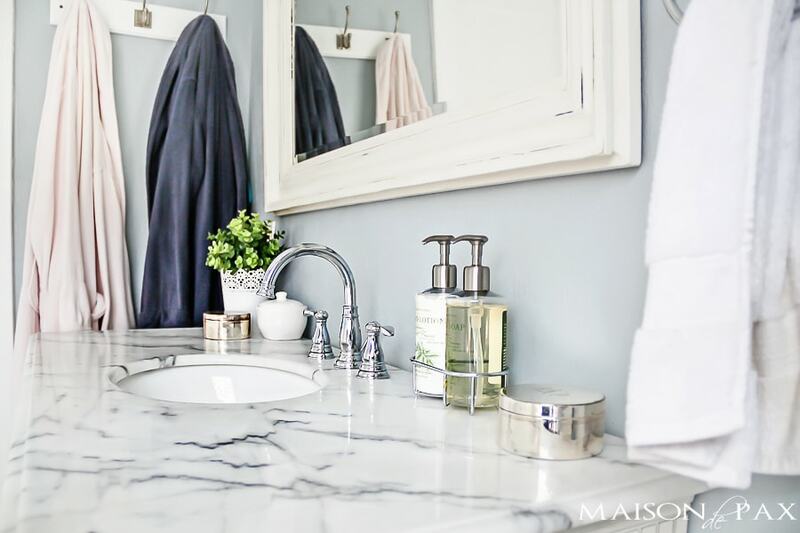 Your bathroom is a breath of fresh air…so lovely! I am thrilled with joy after reading your post because I want to change my bathroom style and thus need some help. Rachel…I know paint totally transform the look but I am always confuse on the selection of colours. Thank you so much for this helpful post, I will keep in mind these tips but with this I am also curious for your next list of details. Hope you will update this ASAP. What is the name of the color you used? I love it! What a lovely redo. 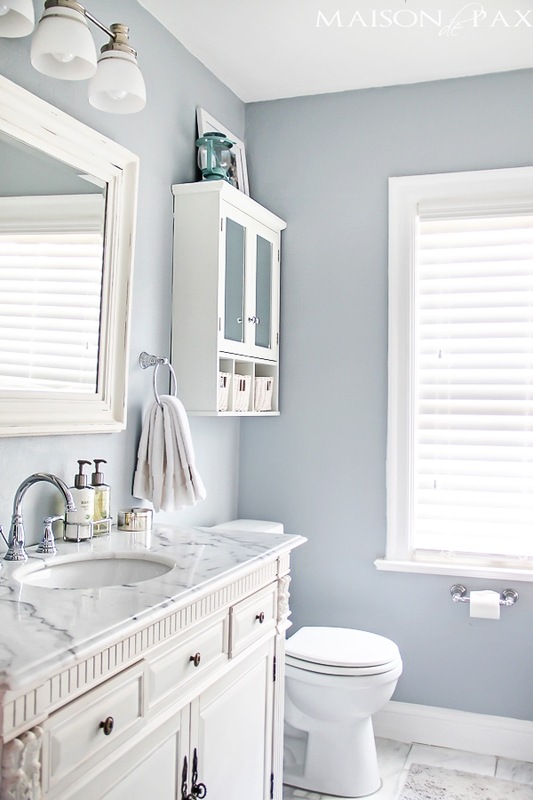 It’s crazy but when I first saw this on Pinterest, I couldn’t believe how much it looks like my guest bath, which I’m in the process of redoing too. I have a pedestal sink right now and want to put in a vanity sink for the counter space. I love yours. Can you share where you got it? That’s great, Sharon! You must have good taste. 😉 The vanity is made by Bellaterra, and I’ve posted a link to it in this post: http://www.maisondepax.com/2013/11/source-list-and-budget-tips-for-master-bath.html Good luck with your remodel!! This is beautiful, bright and open, I love it! I love the glass on the shower but does it get too much water everywhere or does it contain it pretty well? Seriously thinking of doing this in our bathroom since its the same layout and size. Thank you so much, Madalyn! We have not found that much water escapes. If we don’t use a bathmat, we can see the splatter, but it’s never so much that the mat feels wet afterward. I think it helps that we hung the showerhead rather high, making the angle of the water more down than out. Great question, Catherine. Is your current mirror glued to the wall or just hanging on a nail? If it’s just hanging, then put it in a closet somewhere and find a thrift-store or Home Goods mirror for a decent price and hang it in its place. It would be easy enough to put the original one back when you move. 🙂 If it’s glue to the wall, then you can search for an open frame (Hobby Lobby sells them… probably other craft stores, too) that fits the mirror and try hanging it on top. Hope this helps! Love your bathroom. I’m in the process of redoing my bathroom. I’m looking for a medicine cabinet just like yours. Can you tell me where you bought your? Hi Miste! I’m so glad you like the bathroom!! I found that medicine cabinet at Lowes, and we’ve been really happy. You can find a link to it and our other sources here: http://www.maisondepax.com/2013/11/source-list-and-budget-tips-for-master-bath.html I hope this helps! What a fantastic make over! A great bunch of tips too. 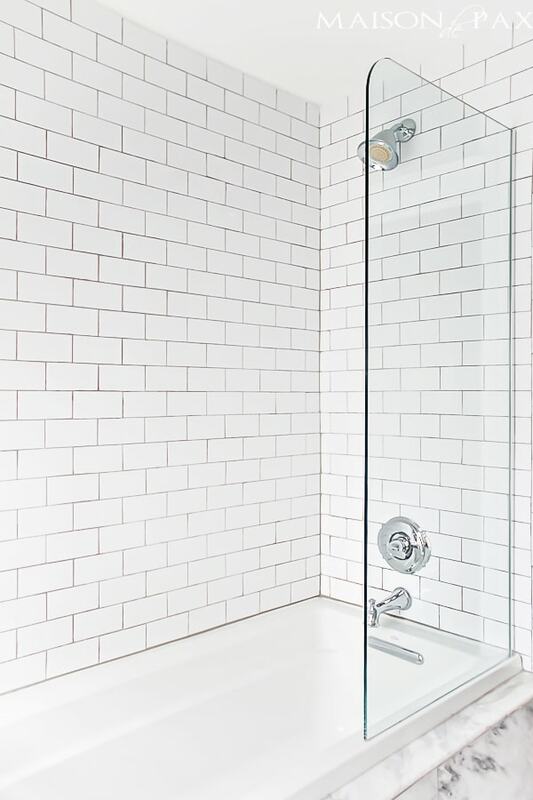 I love the look of the subway tile – do you find it is hard to keep clean? Love everything, especially the marble countertop except for one thing. Overhead lights are very unbecoming and problematic when putting on makeup. Sconces on either side would have been much better! I have this problem in my bath and powder rooms, too , and can’t wait to change them! This is such a lovely bathroom. I am looking to use this soft blue in my bathroom which is a bit larger than yours. What is the brand and color of this paint? Thank you so much! I’m so glad you like it. 🙂 The blue is Krypton by Sherwin Williams. You can find the rest of the sources for this bathroom here. Hope this helps! I love your glass shower wall. Any ball park figure as to how much it cost with install? Did your general contractor install it? It looks amazing- simply like it’s resting on top of the tub without any hardware. I am a DIY kind of girl as well, but that looks out of my league, though I would LOVE to have it in my bathroom. Any info would be appreciated. Hi Angie! Thank you so much for your kind comment – I’m so glad you like it. 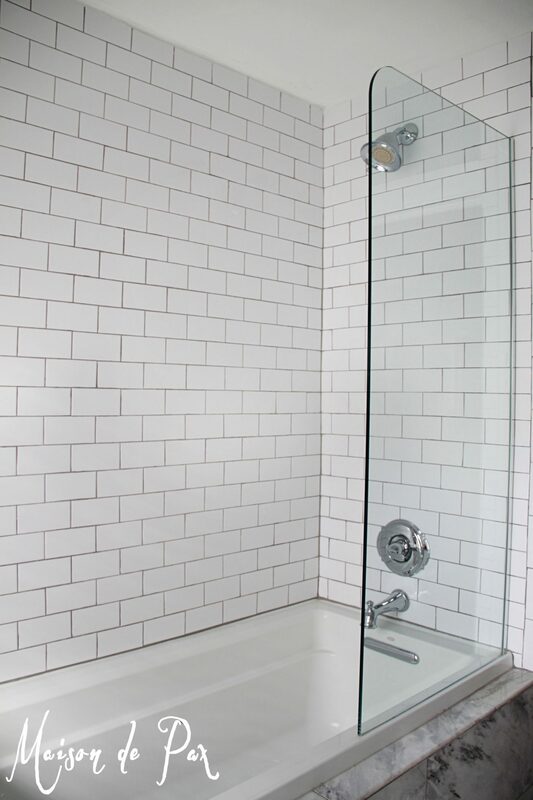 We love the shower wall, too; I kind of think it makes the bathroom. If I remember right (and please don’t quote me on this – it’s been over a year! ), it was $650ish. My contractor outsourced it to the glass company (the glass and the installation), but I think that was the budget allotment we gave to the glass wall. That price included the glass, a special clear protective coat (to keep it from getting water spots), and the installation. I hope that helps! I am coming very late to the discussion; however, I would like to ask if the grey grout works for you? I like white groat but the upkeep! Also did the tiles to ceiling pose a cleaning problem? Anything has to be better than my peeling paint above the tile! Thanks for sharing your great ideas. I’m so relieved to have found this little bathroom re-do! I’m pretty much going to use all of your ideas and so I really appreciate all of your work! I have one question: Are you still happy with the vanity and everything about it, or would you look for something different now? I really like your small bathroom ideas. We are getting ready to redo a bathroom in our house and I love your colors. Can you tell me where I could find the medicine cabinet with the mirrored doors? Thank you so much, Laurie! We found the cabinet at Lowe’s. You can find a full source list and a link to the product at the bottom of this post here. Hope this helps! Thank you so much, Shannon! I don’t mind the depth of the vanity at all. Of course, it fits entirely in the space to the left of the door as you enter. If it protruded into the doorway, that would definitely make a difference in my mind. And we actually changed the door so that it swings out; that makes a big difference. If it swung in, it would conflict with either the vanity or tub. I think the size is perfect, and the fact that it’s white helps the brighten the space. I hope this helps! Great point about the door swing. I think I’m going to dive in and just do it. Thank you for your help!!!! You are so welcome, Shannon. Good luck! love the bath redo. really like the mirror over sink, where would you find one like that ? I’m so glad you like it, Donna! I found that mirror at HomeGoods (though it was black when I bought it). You can find a full source list for the bathroom here. Hope this helps! This is so gorgeous ! Thank you for posting. One quick question, do you find the step into the deeper tub to be difficult? I adore the shower wall, but since it’s a permanent fixture, I guess you enter the tub from near the end? We are in great shape, but will eventually sell this home, and I don’t want to deter an elderly buyer. I suppose I could do a standard tub in leu of a soaker tub. Any thoughts? Again, beautiful design. Ironically I just remodeled one bath in a similar design prior to seeing this, and love it so much I plan to do another bath with the same concept:) thanks again! Thank you, Lindsey! You are so kind. I completely understand your concern, and I’d say it’s 50-50. We actually have ours raised a bit higher even than required because we built it up to sit directly under the window (about 24″ off the floor). You could probably get a smaller soaker tub and still only put the final height around 20″ off the floor which might help. We have no problem getting in and out, but I could see how it might make an elderly person nervous… I hope this helps! Hi! I love this marble, where did you purchase it? Everyone I have found marble tiles they are upwards of $8 a square foot but maybe prices have just increased since you wrote this. Hi Casey, so glad you like it! 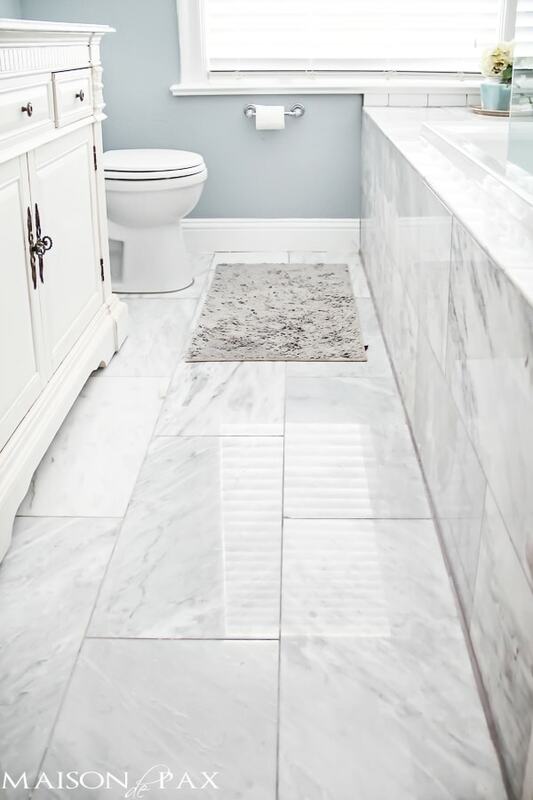 Unfortunately, my contractor found it for me, but I recently saw some affordable and gorgeous marble tiles at FloorAndDecor.com Hope this helps! I’m planning to renovate my daughters bathroom sometime this year. I love subway tiles. They’re timeless! My question to you is about the gray grout. Do you regret not having chosen a white grout? Does the gray grout make the shower appear dirty? In our master bathroom I considered using gray grout but went with white because I was afraid the gray would always look dirty. Now I’m afraid the white will discolor. Bleach, bleach, bleach! I’m so glad you like it, Sasha! Unfortunately, I don’t have a name for the tile. My contractor found it at a wholesale place, but it’s essentially a polished gray and white marble in 12×24. I hope this helps! What color is this paint and where was it purchased? SW Krypton. You can get the full source list here. Hope this helps! I would love to know what color you used in the bathroom. It’s beautiful! Please let me know via email if you are willing to share! Thank you so much! It’s Krypton by Sherwin Williams. You can find a full source list here. Hope this helps! 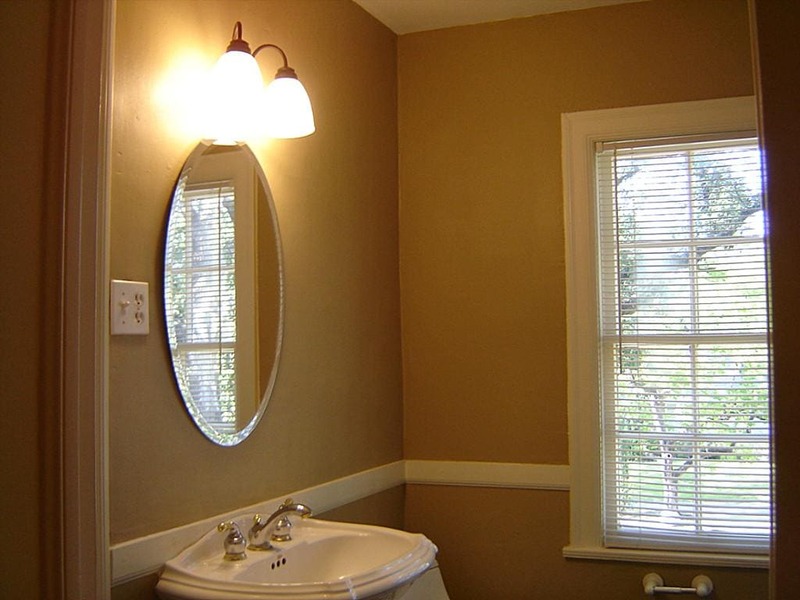 Hi: I really want a glass half wall in my even smaller bathroom but it must also serve as the powder room for guests. What do you suggest in that situation? Thank you! The tricky thing there is that you can see everything… Can you keep the tub/shower neat enough all the time? If so, then I say go for it! Even as a powder room, a light, bright space that doesn’t feel cramped is a great relief. 🙂 Hope this helps! I am obsessed with your bathroom! This is perfect for my space. Does the stuff on the ledge in the shower get wet? I know this post is like 3 years old but I hope you still see this! Thanks, Alicia! We have since moved from that home, but in my memory… somewhat. The water didn’t pool there or anything (unless I did something weird to spray it over there like trying to wash a dog in the tub), but it definitely received some overspray. I think it helped that we hung our shower head rather high (because my husband is 6’2″). This allowed the water to spray down on top of us rather than out at us. Does that make sense? Hope this helps! Beautiful….I am currently doing up my Bathroom and it’s much the same as this. May I ask the color on the walls? Thank you! It’s Krypton by Sherwin Williams. Can you tell me where you got the medicine cabinet for above the toilet? Hi Adrina, it came from Lowes. You can find a direct link to it and all the other sources in the bathroom in this post. Hope this helps! I just love everything about your remodeled bath. I have always had shower curtains, but really love your glass half wall. Is it fixed or does it swing out? If fixed, I’m wondering if you can reach around it to turn on the water or do you have to step in the tub? Thank you, and again, thank you for sharing your beautiful bath! Hi Shelley, so glad you like the bathroom! We ahve since moved out of that house, but the shower door was fixed. I didn’t find it difficult to reach in and turn the water on (until I was about 9 months pregnant… at that point it became tough to reach!). I hope this helps! Hi: I think you mentioned you have now moved from this house but I have to compliment you on a lovely “redo” of your bathroom. I am also impressed with the fact that you respond to every question your readers ask. I follow a very popular blog which gives many decor tips but the blogger rarely answers questions so I commend you on this fact! I hope you won’t take this as criticism (please don’t, okay?) but … is there a reason you hung the bathroom tissue under the window? I see that done in many US decor blogs and have often wondered why. If it were my bathroom, I would have hung it on the side of the vanity (the right side of the toilet when seated) So that it doesn’t show. However, perhaps you have children and worried that they may yank the holder out of its fastening screws if screwed into the vanity. Just curious in Ontario! Haha… It’s ok, Elaine. A totally fair question. 🙂 Honestly, my kids have been known to tear those things out of the walls before, and I was worried that if I put it in the vanity and it got torn out I wouldn’t be able to repair it very well. Sheetrock is much easier to mend! Thank you for replying so fast and for not being offended at my question! My kids were rough on those things too! lol! Not offended at all. 😉 Have a great day! Absolutely stunning bathroom remodel! I love the tub/shower combo with the white subway tiles. 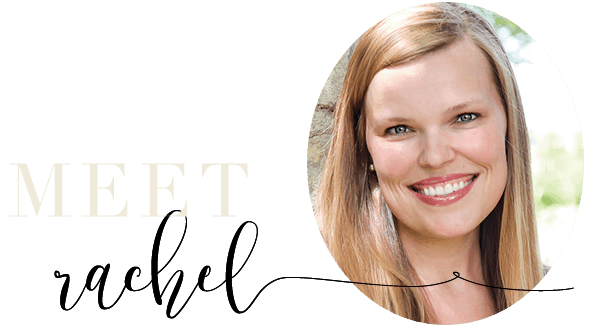 Beautiful use of the space, Rachel. I have shifted your ideas to my masterbath refresh. It isn’t small, but the ideas you suggest are practical and fabulous. Thanks for sharing. Oh Susie, I’m thrilled to hear that you found it all helpful! I hope your master bath reno goes well!! 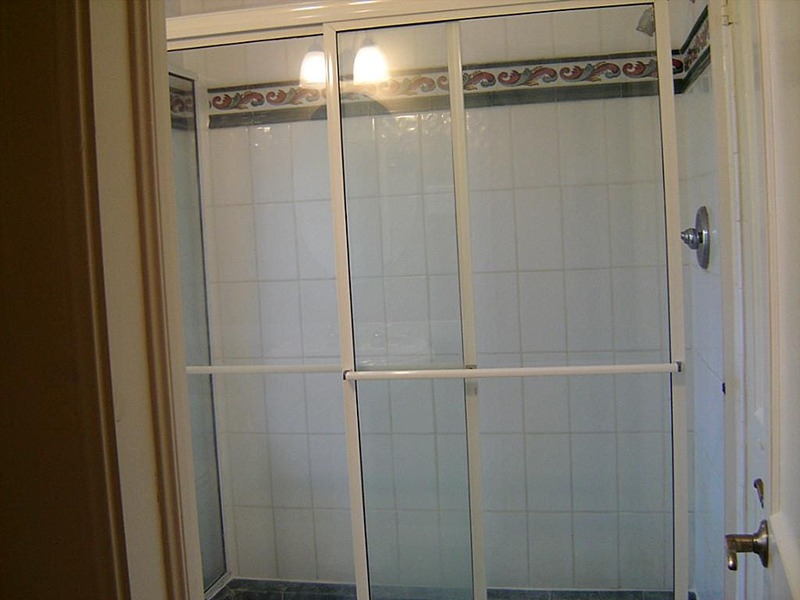 Was it ever a problem to reach and turn on the water with a fixed frameless glass divider on the tub? Thank you! You can find a link to it and all the sources in that room here. Hope this helps! I have a bathroom that is extremely similar to yours and I read that painting the cielling the same color as the walls makes a space feel bigger. I debated doing it for a few years aa I thought it would look weird. Anyways one day I finally did it and it really does help!